According to the Science Daily based on United Press International reports, researchers from North Carolina's Duke University discovered a series of genetic variations that could help HIV-infected people avoid developing AIDS. The study, which was led by scientists at Duke's Center for HIV/AIDS Vaccine Immunology, used Human Genome Project research to find specific variations in a trio of genes that offer hope for a better understanding of how to control the HIV virus, the San Francisco Chronicle said Friday. By focusing on the individual stability of the virus within a patient's bloodstream, the researchers were able to discover two genes that appeared to help control the virus. Through analyzing the genetic makeup of 486 patients in relation to virus control, the scientific team came up with the HLA-B*5701 and HLA-C genes. The team, that also included several other scientists worldwide, found that each gene was able to control the HIV virus in its own unique way. A third gene, ZNRD1, was recognized by the group for its apparent ability to limit HIV replication, the Chronicle reported. 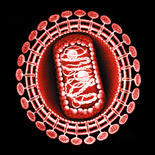 Here is a link of an outstanding 3D animation of HIV replication cycle. Hope you will find it informative. It is about six minutes log. So be patient. The animation is fairly accurate representation of what we know about the this viruses life cycle today, except the part on entry of viral DNA into nucleus. Based on our current knowledge, import of viral DNA into nucleus is not dependent on integrase but other viral and host proteins that are still elusive. Integrase is however necessary for the integration of virus DNA into host genome.